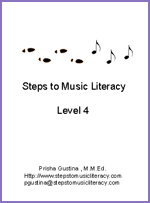 The "Steps to Music Literacy" materials provide 1) a how-to-teach manual referencing the National Standards for Music Education, 2) level appropriate songs to sing, play and read in treble clef, 3) writing pages for practice and assessment, and 4) classical master works. 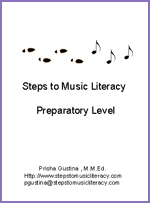 The Preparatory Level, Level One and Level Two books also include 1) interactive audio files with accompaniments and child voice demonstrations, 2) written piano accompaniments, and 3) mp3's of all music for ipod or CD use. Levels Three, Four and Five are in PDF book format. Free upgrades to Interactive formats will be available upon publication.